It happens every year at the office. Employees go home with a stomach bug, the flu or another virus from the workplace. The germs that cause these illnesses can scatter throughout the workplace in just a few hours. And those germs lurk in the most unexpected places. Here are some tips on how to get rid of those germs. While you may think the restroom is a hotspot for viruses and bacteria, it’s likely one of the cleanest areas due to regular cleaning. You’ll find harmful microorganisms thriving more in and on the shared office refrigerator, microwave and faucet handles in the break room. Be sure to use anti-bacterial wipes to clean these areas on a regular basis. And if there is a communal kitchen sponge, get rid of it. They’re ground zero for germs, as bacteria thrive in moist environments. Did you now that the average desk harbors 350 times more bacteria than the average toilet seat? Phones and keyboards are germ culprits, too. Plus, if you eat food at your desk, there’s a higher level of bacteria contamination. Keep your desk germ-free by cleaning it with disinfecting wipes. And be sure to shake the crumbs from the computer keyboard and clean it. If you’re sick, stay home. Get the flu shot and be a smart sneezer. When you cough cover your sneeze with a tissue. In addition, regularly wash your hands when at the office. Keep a hand alcohol-based sanitizer at your desk for those times when you can’t get to the restroom to wash your hands. 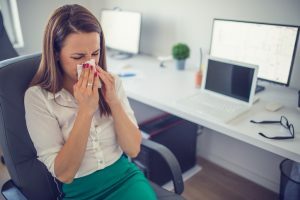 All of these preventative measures will help kill those nasty germs and stop illnesses from spreading throughout the office. If you’re using work drinking glasses or coffee mugs at work, be sure to wash them with hot, soapy water on a daily basis. It’s a guaranteed way to get rid of those germs that are likely to get you sick. Sometimes, a germ can cause an affection that may adversely affect joints, the spine and even the ankle. Turn to Southern Orthopedic Specialists for an evaluation and treatment if this should happen. Our Jacksonville orthopedic center has trained specialists to help you.